For the first time, astronomers have captured a planet that orbits around two stars instead of one. 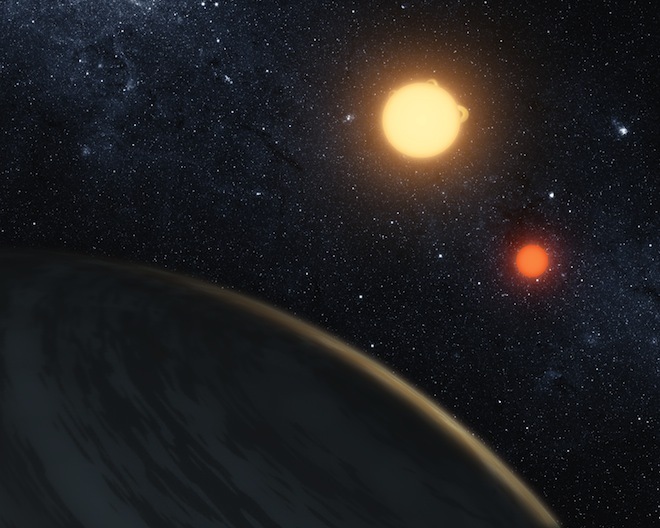 “If you could visit there, you would see a sky with two suns, just like Luke Skywalker,” said Nick Gautier, an astronomer at NASA’s Jet Propulsion Laboratory in Pasadena, California. He was speaking at a NASA press conference to announce the discovery. The finding will appear in the Sept. 16 issue of Science. Astute geeks will remember that Luke Skywalker grew up on a planet called Tatooine that also orbited binary stars, and one scene from the Star Wars films boasted an impressive double sunset. Using the Kepler space telescope, astronomers spotted the Saturn-sized planet traveling around a pair of stars approximately 200 light-years away. The exoplanet takes about 229 days to orbit its dual parent stars. On hand during the NASA press conference was John Knoll, a visual-effects supervisor from Industrial Light and Magic in San Francisco, the production company that created the special effects for the Star Wars films. Knoll said that in the original films, George Lucas was using the double sunset as a visual shorthand to show viewers that they were in an odd, exotic place. “This is unambiguous and dramatic proof that such planets do form around binaries,” he said at the conference. The two stars, which are roughly three-quarters and one-fifth the mass of the sun, are actually relatively cool. The surface temperature of the planet is therefore estimated to be a chilly minus 100 to minus 150 degrees Fahrenheit, perhaps making it more like Star Wars‘ frosty planet Hoth than the balmy Tatooine. Unfortunately, reality is not as cool as fiction. Much like Saturn, the newly discovered planet is a gas giant, which means there is no surface on which to stand and watch a double sunset.